When it comes to music in the MCU, Guardians of the Galaxy is the one that has the reputation for the most rockin’ soundtrack. The cosmic franchise’s Awesome Mix of ’70s and ’80s hits has been massively popular, but it’s Captain Marvel that has all the ’90s love. The new Marvel film features a soundtrack of ’90s tunes and it’s clearly leaving a big impact on audiences because all of these songs combined jumped 464% in downloads. Captain Marvel is the newest MCU film and follows Brie Larson’s Carol Danvers as she tries to discover her past while stuck in the middle of a war between two alien races. The film is set in the ’90s and contains several memorable throwbacks to the decade, such as Blockbuster and dial-up internet. To help keep everyone in the spirit of the ’90s, the film’s soundtrack includes hits from bands like Nirvana, No Doubt, and Elastica. It’s a nostalgic throwback that has the millions of people who have seen the superhero movie in the ’90s mood, because these songs have skyrocketed in downloads and streams since the the movie premiered on March 8. Captain Marvel features 13 rock, pop, and rap songs on its soundtrack. Combined, they collected a 464% gain in sales in the U.S. in the four days after Captain Marvel released in theaters, according to Nielsen Reports (via Billboard). That means that combined, the songs were downloaded 9,000 times — compared to 2,000 just four days before March 6. Apparently, The Marvelettes’ “Please Mr. Postman,” which Nick Fury sings for all of five seconds, is included in this measurement. For those curious which song was the highest-seller from the soundtrack, that title goes to “Celebrity Skin” by Hole. The song jumped 2,222% in sales to nearly 2,000 downloads during the tracking span. Other songs that saw over 1,000 downloads include Garbage’s “Only Happy When It Rains” (up 1,351%), No Doubt’s “Just a Girl” (up 720%), and Nirvana’s “Come As You Are” (up 371%). Of course, we can’t forget to look at streaming, and the 13 songs saw some notable gains in that area. Collectively, the soundtrack saw a 43% gain, which equates to 4.09 million streams on March 7-10. Comparatively, the collected songs had 2.85 million from March 3-6. Never underestimate the power of a good throwback! The soundtrack is clearly playing well with people and now it makes me curious if the inevitable Captain Marvel 2 will continue the trend and feature more ’90s songs. If the sequel takes place in space or the present day, it probably wouldn’t make too much sense. 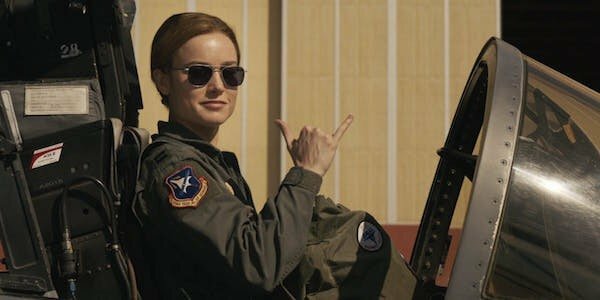 You can listen to this rippin’ soundtrack in Captain Marvel, which is in theaters everywhere. For everything else hitting theaters this year, check out our 2019 movie release guide.